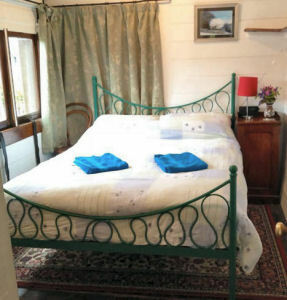 The Travelling Post Office offers fine self catering holiday accommodation with lots of character, sleeping up to four comfortably, or up to 6 using a sofa bed in the lounge. 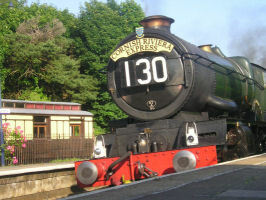 It is located on a railway siding adjoining the station platform at St Germans, in South East Cornwall, UK. There are fine views of passing trains on the adjacent GWR Plymouth to Penzance main railway line and over the Lynher valley. 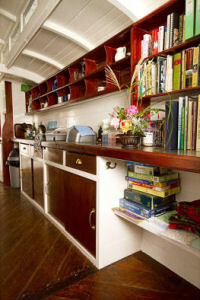 The Travelling Post Office has a wood burning stove, as well as electric heating with all fuel included. 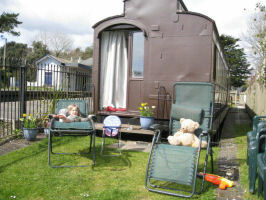 Pets are welcome and will enjoy the enclosed garden and the ten acres of private woodland just a few minutes walk away. 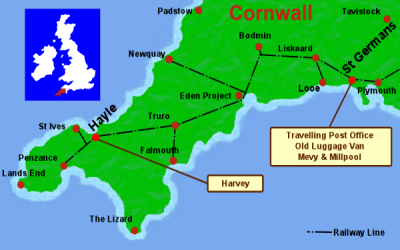 Our pets page has lots of pet freindly places in Cornwall. As with all our projects, we have aimed to combine authenticity with all the comforts you could wish for on holiday. 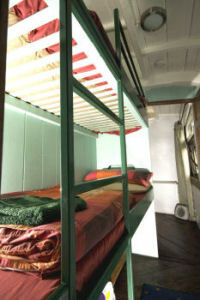 The TPO is very well equipped, with a comfortable double bedroom, bunk-room (with views through the clerestory windows! ), wc with shower and lounge diner with a leather sofa bed. A cot and children’s toys can be provided on request. The TPO still retains its original letter boxes, and letters can be posted through the garden side box. 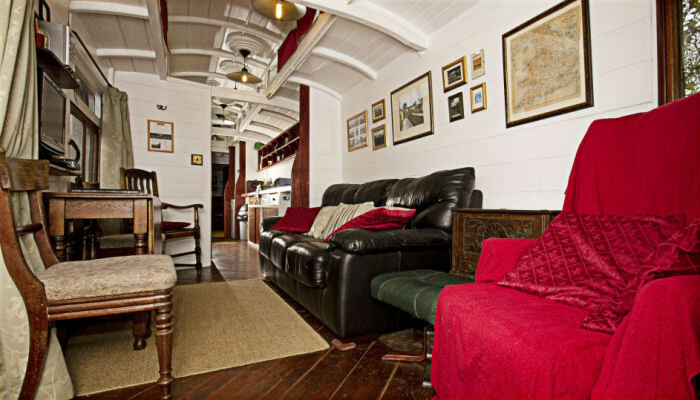 We have designed the interior to reflect its original purpose as a mail coach, and of course all the usual Railholiday touches, such as our Cornish welcome pack and variety of interesting games and railway books are included. 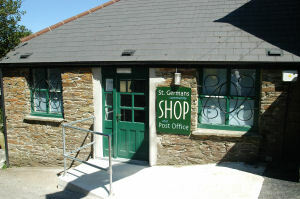 Visit the St Germans page for pictures and more about this beautiful area. Travelling Post Office no 841 began its life as a standard gauge body on broad gauge bogies, with three passenger compartments, a sorting area, gangway, mail bag net and four delivery arms. It was numbered 2086. In 1896 the compartments were removed to increase the sorting area, and the vehicle was renumbered 841. In 1904 it made history by being pulled behind the City of Truro when it made its record-breaking 100mph run. Perhaps it held the gold bullion? More regularly it was used for Bristol to Penzance runs until it was taken out of service in 1934, after which for many years it formed part of a house in Wales. For more on the the history of the TPO click here. Click here to book your holiday in The Travelling Post Office on-line now or check availability and prices. St Germans is a small village with a population of 600. 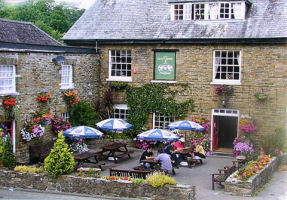 Only a ten minute reasonably level walk from the carriage is a great village pub, The Eliot Arms, (01503 232733) serving Cornish ales and excellent food.